Redlands, California—Esri, the global leader in spatial analytics, today announced that Dr. Dawn Wright, Esri chief scientist, will speak at the EarthxOcean Conference being held April 20 through 23 in Dallas, Texas. Presented by Mission Blue and EarthX, the conference is designed to increase awareness of the important roles that oceans play in peoples’ daily lives and to stimulate greater corporate and government support to protect the world’s oceans.Wright will join John Hanke, Niantic Labs; Chris Mathias, Puente Institute; Wetherbee Dorshow, Earth Analytic; and Ben Goldstein, End Point on a panel to discuss The Science of Where. Panelists will talk about the importance of using location intelligence technology to map and analyze the water column globally to provide sustainable solutions for meeting challenges including rising sea temperatures and declining marine health. Wright is a notable authority in geographic information science, and for more than 20 years has teamed with scientists worldwide who use GIS to map and analyze terrains, ecosystems, and habitats. 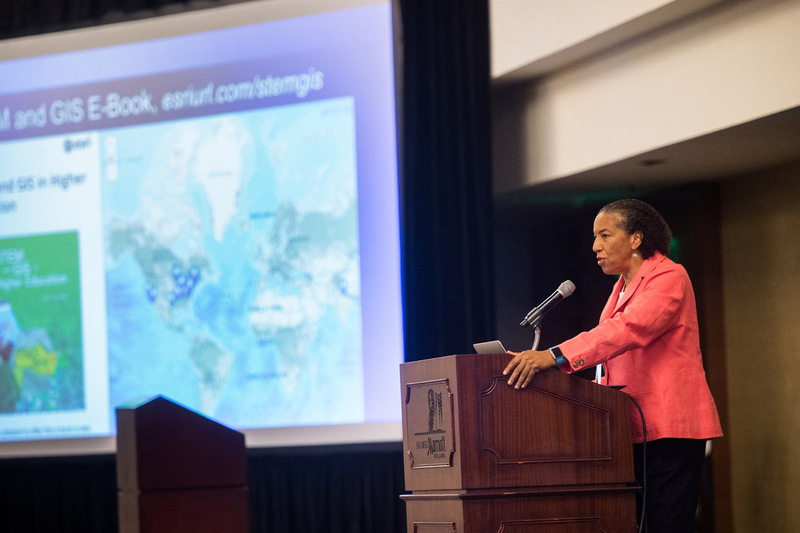 She combines her expertise as both a geographer and GIS user to map the seafloor; design geospatial solutions for ocean charting; and advise organizations on oceanography and fisheries, including her current service on the National Academy of Sciences Ocean Studies Board. Also speaking at the conference will be Drew Stephens, Esri industry manager for ocean and coastal environments. Stephens has worked with Esri for many years promoting the use of GIS to design sustainable practices for land and sea and helping place geospatial technologies into the hands of ocean scientists, fleet managers, and government analysts for decision-making, planning, and policy implementation. Under Wright’s direction, Esri created the Ecological Marine Units (EMU) app that uses data sourced from the National Oceanic and Atmospheric Administration’s (NOAA) authoritative World Ocean Atlas, with marine chemistry information from the National Aeronautics and Space Administration (NASA) and topographic data from GRID-Arendal. The app provides access to comprehensive 2D and 3D data and serves as an educational tool for easily understanding marine environments and how they are affected by climate change. Esri has committed the EMU data and app to the United Nations Sustainable Development Goals 13 and 14, Climate Action and Life below Water. Learn more about Esri’s commitment to the oceans at go.esri.com/pr-emu.